The Royal Teak Collection™ is made from teak harvested in government-controlled plantations, which means it is the best available teak (A Grade) on the market. This high quality teak is free of knots and is uniform in grain and color. The Royal Teak Collection™ is kiln dried and made entirely by machine with mortise and tenon joints, ensuring a tight fit. For best quality, only brass hardware is used. The high content of oil in the teak protects the wood from the elements and makes sure you enjoy your furniture for many years to come. 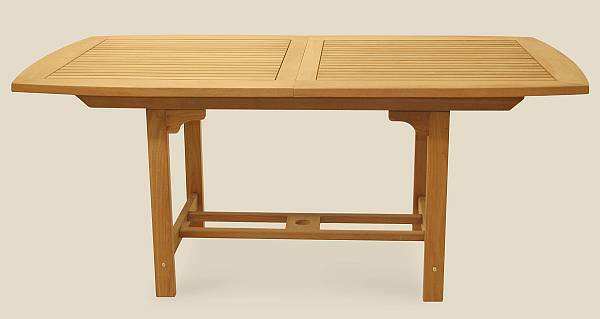 The Rectangular Family Expansion Table provides enough room for a wonderful family gathering. Enjoying an outdoor family event is easy with this versatile table. 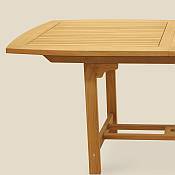 The table has a convenient self-storing butterfly-leaf that adds another two feet to each table. Choose the table size that is right for your family needs, and you will have a treasured furniture piece for generations. Pair one of the tables with one of the several great styles of chairs from the Royal Teak Collection (as shown below), and you will not be disappointed. Availability: Usually ships within 7-10 business days.